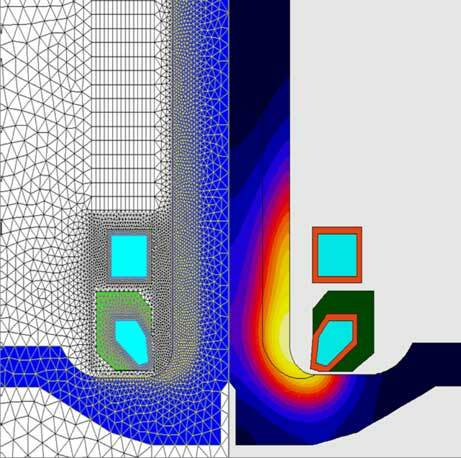 Computer simulation or modelling is a powerful tool for analyzing induction heating systems. Fluxtrol extensively uses computer simulation for the development and optimization of induction heating coils and processes. As compared to many other companies who use computer simulation only once they have not achieved the desired results empirically, Fluxtrol begins nearly every project with computer simulation to ensure that the best possible solution is delivered to the customer. Fluxtrol specializes in computer simulation for the optimization of the magnetic and thermal processes occurring during an induction heating process. Using computer simulation, Fluxtrol can analyze the impact of changes to the geometry of the workpiece, material of the workpiece, motion of the part relative to the induction coil, induction coil copper dimensions, the influence of the magnetic flux controller geometry and properties, the power and frequency profile, quenchant type and intensity, the coil cooling circuit and heat exchange with surrounding bodies such as insulation or heat sinks on the temperature dynamics both the workpiece, power absorbing bodies in proximity to the inductor and the induction coil components themselves. Fluxtrol has been using computer simulation for more than 20 years and has determined that the most efficient and highest quality solutions for complex problems are achieved when employing different types of computer simulation programs for solving different tasks and partnering with experts in their respective disciplines. Internally, Fluxtrol utilizes both ELTA and Flux. ELTA is a 1D FDM engineering program with additional analytical formulations for calculations of 2D effects that is excellent for quick analysis of induction system and setting the process parameters. Recently, ELTA has incorporated some customized 2D models for simulation of selected problems like heat treatment of gears and heating of slabs. Flux (capable of both 2D and 3D analysis) is a FEA software for simulation of the electromagnetic and thermal processes, with the added ability to incorporate motion of the part or inductor. For Multiphysics (in addition to electromagnetic and thermal) models, Fluxtrol has achieved excellent results partnering with their customers by exporting results from their software for import into complementary codes used by their customers or their colleagues. A good example of this is performing metallurgical transformation, residual stress and deformation analysis of parts during heat treating and consequent service properties. This technology allows us to predict part performance and create proposals for manufacturing process optimization. To demonstrate this capability, Fluxtrol partnered with Dante solutions and published a series of papers on the topic. In order to validate the results, Fluxtrol invited the Chief Metallurgist at Dana, Greg Fett, to participate in the papers. Fluxtrol has since used this method with several customers to solve real world heat treatment issues. Fluxtrol has also partnered with customers using many other types of simulation software to help them developed improved technologies that have been implemented successfully. Contact us today to see how computer simulation can work for you.